Gardening plants present you with an almost limitless supply of choices that you can pick from when starting your own garden. The real question is where do you begin??? Do you go with bright colorful annuals, that will give you an incredible show of color and texture, only to die out at the end of the season, or do you go with reliable perennials that will come back and greet you year after year? Annual Flowers: Annuals are flowers and plants that bloom the same year in which they are planted. Once their blooming cycle is done, they seed and die off. There is a large variety of gardening plants that you can choose from to put into your garden, but you will need to decide if you want them to come back every year, or if you are comfortable replanting them year after year. Annuals are some of the brightest and vibrant gardening flowers plants trees that one could choose, and you can mix and match colors for virtually any theme you can think of. Perennial Flowers: Perennials are gardening plants that, in most growing zones, will come back year after year with proper care. 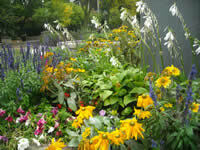 Perennials tend to have lush foliage most of the growing season but a shortened blooming period compared to annuals. Perennial flowers will usually last at least 3 to 5 seasons, but every so many years they will need to be rejuvenated or replaced. There are also varieties of perennial flowers that that are considered "tender perennials", meaning they can be killed off by a frost. 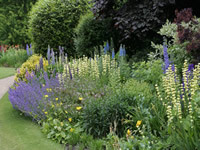 Typically tender perennials are usually grown like annuals in most gardens. Herb Plants: Herb plants are extremely versatile gardening plants that have a great many uses in our day to day lives. Few meals are prepared anywhere without the culinary use of herb plants. Many medicines began and derived from various herb plants that mankind discovered growing in nature. Herb plants can be grown in traditional gardens alongside most gardening flowers plants trees, as well as in indoor gardens and containers. You can start an herb garden right in your own kitchen so that you can have fresh grown herbs available for your favorite meals. Herb plants are a great way to get children into gardening as well. Trees & Shrubs: Most homes have some form of tree or shrub planted around them. Trees, in spite of being slow growing, offer a tremendous amount of decor for any landscape. Trees also offer valuable shade and shelter for various other gardening flowers plants trees in your garden. Shrubs are also commonly found around many homes as a border between properties, or between individual gardens. Shrubs and hedges can be shaped and formed into almost anything you can dream up and many gardeners use them for an artistic addition to their homes. Shrubs and trees take years to grow and cultivate so make sure you set aside plenty of time to make your plans come together. Ornamental Grasses: Ornamental grasses are increasing in popularity in gardens all over. As urban sprawl takes off and developments start spreading out all over, a drive around town is all you need to see all kinds of beautiful ornamental grasses. Grasses are a great complement for most gardening flowers plants trees. You can use ornamental grasses as a backdrop for just about any garden design. Grasses are available in short and stubby varieties, tall and slender varieties, and many sizes in between. Most have some sort of bloom that comes late in the growing season. Bulb Plants: Bulb plants have become a staple for most gardeners. Few people design a garden without having some sort of bulb plant in it. The great thing about bulb plants is most of them are perennials, meaning they will come back year after year. Bulb plants are also very easy to dig up and separate every so many years to thin the plants out and start new ones. There are a great many gardening plants that grow from bulbs, so if you enjoy a bright colorful bulb garden like most people, well then you have a few decisions to make. Some bulbs are extremely hardy and can survive winters just about anywhere, while others are not very hardy at all and need special care. Just make sure you do a little research so that you know which bulbs will be high maintenance, and which ones are not. Shade Plants: Shade gardens are extremely lovely and one of my personal favorites. While most shade plants offer little in the way of big colorful blooms, what they do offer is an abundance of colorful foliage. Hostas are a common shade plant that most gardeners turn to when they think about starting a shade garden. One of the biggest issues I see with many shade gardens is the improper selection of plants. Just because you would like a plant to grow in a shady location, it does not mean that particular plant will have the same agenda. Most plants can grow in shade, but not all of them will thrive and give you the desired results, so make sure you take the time to look into a wide assortment of shade tolerant plants, and make your selections from there.